Paul Nuttall has resigned as Ukip leader after his party had a disappointing result in the British elections. Paul Nuttall has resigned as Ukip leader after his party's woeful showing at the General Election. The Eurosceptic party had been hoping to make gains in Thursday's poll, with Mr Nuttall running a campaign pledging to "ensure there is no backsliding on Brexit". But after Ukip failed to gain a single seat in Westminster - and with Mr Nuttall coming third in Boston and Skegness - he opted to leave his position, telling reporters: "A new era must begin with a new leader." He said he had left the foundations for the new leader to build on and ensured that the party was "still on the pitch". And he insisted Ukip was "more relevant than ever" and would play the role in the coming months of the "guard dogs of Brexit". Mr Nuttall failed in his bid to win a Commons seat, finishing a distant third in Brexit heartland Boston and Skegness behind the Tories. Elsewhere, the Ukip vote seemed to disappear, splitting between Labour and the Conservatives. Former party leader Nigel Farage told LBC Radio: "I don't think Paul did anything wrong at all, he didn't have time to establish himself with the public." He added: "I would not lay any blame on Paul Nuttall whatsoever." Asked if he would return as leader, Mr Farage said: "Whether leading or playing a prominent role is perhaps a different question." 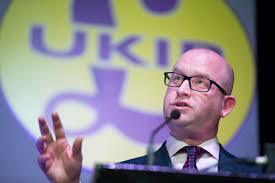 Mr Nuttall's humiliation comes after he failed to win in the Stoke Central by-election in February.